I’m preparing for a talk with UCF data science students later this month on the statistical and machine learning tools we use for our Disney World wait time predictions. After covering the basics – how we collect wait times, the hundreds of things we consider (everything from Extra Magic Hours to public school holidays, to the state of Brazil’s economy six months ago) – I wanted to say a little about how to handle the situation where you know in advance that Disney’s posted wait times will be wrong. I’m comparing Buzz Lightyear’s actual wait times and posted wait times using the graph below. 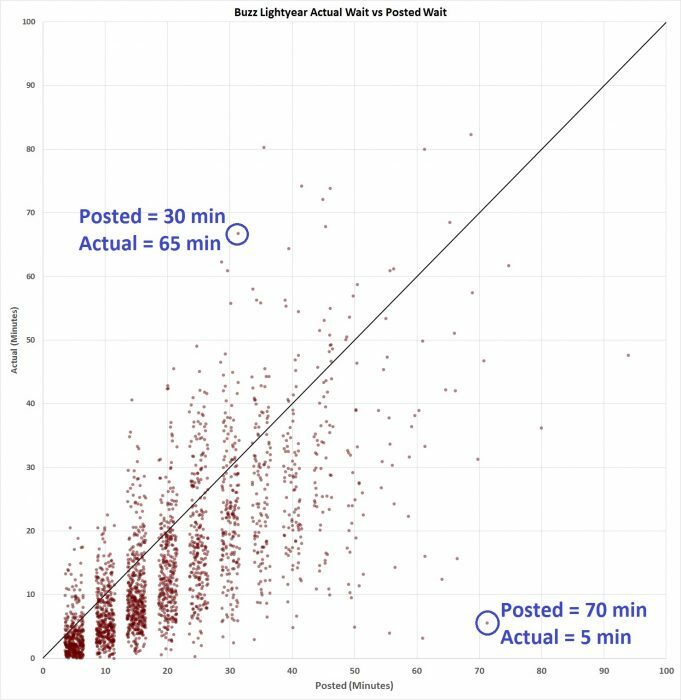 If the time you actually spent in line was exactly the posted wait time, every red dot shown below would fall on the black diagonal line. As you can see, the red dots do not all fall on the diagonal. Some aren’t even close. The dot in the lower right that I highlighted is an example of someone waiting 5 minutes to ride Buzz Lightyear when the posted wait time said they’d wait 70 minutes. The other dot I highlighted, in the upper left, represents someone actually waiting 65 minutes when the posted wait said they’d be there for 30 minutes. The average difference between the actual wait time and the posted wait time at Buzz Lightyear is around 40% – roughly 8 minutes, plus or minus – out of 20 minutes (the average posted wait at Buzz). But as you can see, it varies. A lot. Why is this important? Because it’s a kind of benchmark on how accurate a prediction can be. Suppose you have a crystal ball that tells you exactly how many people will be in the Magic Kingdom tomorrow, and exactly when they’re planning to visit Buzz Lightyear. You still couldn’t predict the posted wait time at Buzz Lightyear any closer than +/- 8 minutes on average. It’s clear from the graph above that the posted wait time at Buzz Lightyear seems to be based on something other than facts like the number of people in line, the Extra Magic Hours schedule, the economy, school calendars, and so on. There are a couple of possible explanations here. Maybe we’re missing some critical data – Disney’s stock price at that instant in time, whether Mercury’s in retrograde – whatever. Another possibility is that posting a predictable wait time just isn’t something Disney can achieve. You can certainly estimate, for example, how many people will show up to use FASTPASS+ at Buzz Lightyear in any hour-long time window. But the actual number of FASTPASS+ users who show up will still vary considerably. If Disney thinks it has already done as good a job as it can with posted wait times, then we’re likely to continue seeing what we’ve been seeing. The good news – for the talk I’m giving to these budding data scientists, and for all of us – is that these wait times seem to behave in predictable ways in some recognizable situations. For example, we’ve noticed that when Space Mountain closes unexpectedly, Buzz Lightyear’s actual wait time tends to be much closer to the posted wait time, because people in the area around Space Mountain will find Buzz and get in line. By identifying the sets of circumstances in which the relationship between Buzz’s posted wait and actual wait are firm, we’re able to chip away at that 8-minute margin. There’s still work to be done, I think, but overall this is good. Does Disney post times that are deliberately inflated to change the behavior of their guests? Yes. Every theme park does it as a way of controlling guest flow. NO! 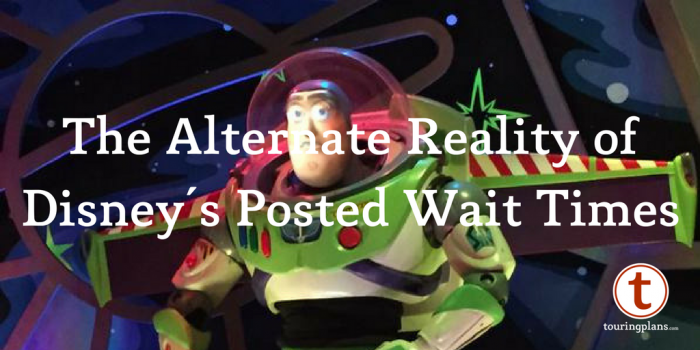 As a former Walt Disney World attractions cast member (now retired) posting incorrect wait times could result in a repremand. It makes sense that any theme park would post wait times which are somewhat longer than actual (as evidenced by the above graph). It is always better to under-promise and over-deliver. It is not in their best interest to post wait times that are significantly longer than actual, though as people will tend to go to rides with shorter wait times and not actually balance the distribution. However, there seems to be another factor involved that Disney can’t control as well. The red tags that they hand the folks in line don’t always make it to the end as expected. Also, there is the time lag involved when a sudden surge of guests appears (or leaves) a line. While the data is not always valid, it still is a great help in planning our visits! The great Len has already answered this definitively, but we have noticed that lines at park closing are typically inflated, sometimes significantly so. We’ve seen a 60 minute posted wait for Seven Dwarves in the last hour before closing with an actual wait under 20 minutes. As everyone in line at closing (at WDW anyway) will get to ride, this is a common cast member trick to get out on time. (An hour line at close means you’re getting out late which may affect your ride home, family, etc.) But if caughy doing this you could be reprimanded. At least it looks like most of the actual wait times are less than the posted times! I’ve noticed that TP’s predicted wait times were much more accurate than WDWs posted times. Keep up the good work!! I’d love to hear more about some of the data science behind the predictions – very fascinating stuff. I was commenting specifically to this Buzz example because can’t rationalize why it’d be in WDW’s interest to skew these numbers so erratically. Headliners, yeah there’s definitely incentive. One thought might be that they just want to get people out of Tomorrowland and into, say, Adventureland, earlier in the day. But there’s still a lot we don’t know about their motivation here. In my 25+ years at WDW wait time was never used to move crowds. Wait time (when controlled by the cast at a given attraction was always to reflect the actual wait as accurately as possible. Just before I retired, when you’d get a FastPass at a high trafic attraction, Disney was giving out another FastPass in a different part of the park for a less trafficked attraction to move crowds. At my last visit,we had just got in line for the haunted house and an employee handed my son a card and asked him if he would please hand it to the employee that seats people on the ride. They were timeing our wait,that is how they do it. Yeah, they send those through like every five minutes I think. But that only tells you what the wait time was when that person got in line. So if they waited half an hour, then the wait time was half an hour half an hour ago. Since then maybe a parade finished or laugh floor let out or whatever and the waits much longer. This. A thousand times this. Thanks Jaina! So glad you see the flaw with FLIK! The end of the line is the only true measure of wait (discounting guest issues, mechanical problems, etc.) FLIK is flawed because it does not know the true end of the line. FLIK is the bane of all attractions Hosts and Hostesses that must use it. If Disney wanted, they could count every person getting in line and loading on the attraction in real time. The have a RFID chip on each guest (ticket or Magic Band). With this information, they could accurately predict how long each person in line will wait. 1) Not everyone wears magic bands, so those with cards would likely not be counted. Why? The RFID chips in the cards are only useful when touched to something. The “action at a distance” MBs require a battery and transmitter, which is what differentiates them from the card. 2) Even if the cards did have the ability to do “action at a distance” (which they don’t), many guests would have them put away after admission in such a way that the RFID signal might not make it to a receiver. 3) Bonus reason: some of us (like my wife and I) who really don’t care about on-ride videos still use our old MBs in which the battery is now dead but the bands still work fine at all touchpoints. Anyone wearing an older band like us wouldn’t get counted either. They could also count everyone with cameras or heat sensors. Grocery stores are already doing this to track visitor traffic and path. No MB needed. Leon, correct there is not a 100% use of Magic Bands. There is a critical mass using Magic Bands and Disney could very closely estimate the total number of people. Also, if you assume the non-Magic Band users are randomly distributed, the rate of people entering the queue and boarding the attrition would be affected the same and the impact would cancel each other out. Len, I had a quick conversation with one of the CM’s at BL on my trip this past December. I asked him about what seemed to be frequent shut downs of the ride (for 1 – 5 minutes each time). He indicated that 25% of the time it was mechanical, and 75% of the time it was to help load/unload passengers with “mobility” issues. I would guess that it would be nearly impossible to build such random evens into your models. Note: the info you provide is invaluable (+/- 8min is nothing!) Great Job. If you feel like posting a longer, equally wonkish continuation, I would enjoy reading it. I’d be interested (not that it’s possible on a 2D screen) in seeing a 3D, where the 3rd dimension is time, i.e. are these times more accurate in the morning/evening/an hour before closing? Are there certain times of day (just before/after parades/fireworks) where the numbers get skewed for a short period of time? An anecdotal example might be: If one watches the fireworks from behind the castle, one will have a near-zero wait if one books it to Winnie the Pooh less than a minute after the fireworks are done. By the time one gets off the ride a couple of minutes later, it can be a 10-15 minute (or more) wait. How much of the skewed data comes from such a situation, and how “repeatable” are the numbers? I agree that things like loading mobility-challenged guests on a continuous loader ride like Spaceship Earth or The Haunted Mansion probably cause more unpredictable variations than anything (other than perhaps ride closures). Let me see what we can do. Good idea! When I worked on Indy @ DLR it was always fairly accurate. Never inflated. While it may be wrong, it works. Sometimes unexpected things come up that guests will never know about that will cause the ride to slow or stop for a little while. I work at a Disney attraction that is like no other. Regular cast members have no control over the wait time despite what everyone thinks so you can not get in trouble in any way. Only coordinators and managers have control overriding the red FLIK card. Sometimes the cards don’t make it to where they are supposed to. It happens. Disney always tries to keep the wait time accurate. It’s difficult though. disney always has to try and make sure the wait time posted is longer than the actual. And just because when you get in line it says 30 doesn’t mean it’s actually 30 because hundreds of other people saw that too and jumped in line. And you don’t see the wait time change when you stand in line. The system works the way it is supposed to. Attractions can raise their wait times at the end of the night if they are projected to close later than everyone is supposed to go home or if the line would take too long to get through to sway guests from going on the attraction. It’s perfectly okay. It’s not right or “nice” but they can do it. I never understand why guests get upset and try and take it out on normal cast members about waiting longer than it said outside. Like I said those cast members have no control over it. Let’s say you want to go on buzz. Someone throws up inside the car and you’re next in line you probably don’t want to ride with vomit so the ride needs to shut down for a little bit. It says 30 minutes posted for a wait time outside when you entered but the cast member now has to call custodial. They get there in minutes but it takes 15 minutes to clean up. Now you’re at a 45 minute wait. Now the cast member has to start the ride back up that takes 5 minutes and you have to wait for a cycle through sometimes which could take 10 minutes. That means you are now waiting 60 minutes for a ride that said 30 when you got in line. So for leeway they can do from 5-20 minutes extra added on in case something else happens. Like I said there is reason behind everything they do. So these stats may show some inconsistencies but it’s normal. Look at your chart and you will see the majority of it is correct or better than that. I’m sure this kind of stuff happens all the time. And it’s not like they can say “temporarily offline – vomit”. I imagine that TP might filter outliers within certain time frames/time differences, but only the TP team could answer that. @Len ??? Yeah, there are filters for outliers. The data above have been filtered. Wow!! 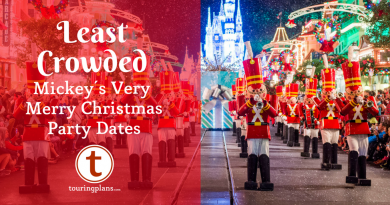 I am impressed how many WDW employees and ex employees read this blog. I know that Touring Plans is amazing but it is even more proof when it’s visited by these employees.